A new "Draft Tim Cook 2020" website was launched on Friday as an apparent effort to convince Apple's CEO to launch a presidential campaign. 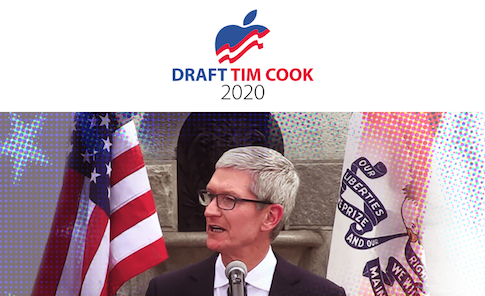 The website, which provides no information on who is behind the effort, features a modified red, white, and blue Apple logo and highlights speeches Cook has delivered in place of a campaign platform. The website also highlights tweets Cook has sent that indicate he is part of the movement to "#Resist" Republican President Donald Trump. 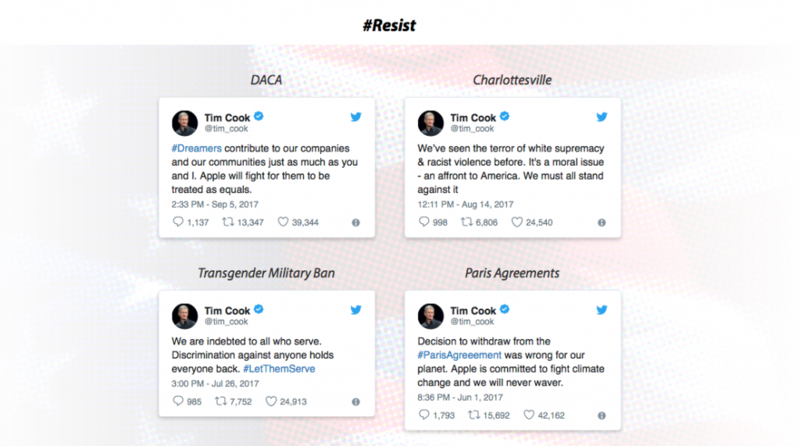 Other tweets are shown to illustrate that Cook has taken a position on DACA, the Charlottesville protests, the transgender military ban, and the Paris Climate Accords. The website also highlights the fact that Cook was almost picked to be the Democrat's vice presidential candidate in 2016, links to various profiles of Cook, and discloses his political activity in recent years. The anonymous group behind the website has also created a "@DraftTimCook" Twitter account on Friday. It has thus far sent only one original tweet. The Twitter account is following 57 accounts, including politicians ranging from Sen. Bernie Sanders (I., Vt.) to Vice President Mike Pence. The account is also following both senators Chuck Schumer (D., N.Y.) and Mitch McConnell (R., Ky.). Also receiving a follow is Tim Cook himself, who is yet to give @DraftTimCook a follow back. The group also created a Facebook page that appears to have been launched on Thursday night. Neither of the social media accounts received any interaction as of Friday afternoon. This entry was posted in Politics and tagged 2020 Election, Apple, Donald Trump, Tim Cook. Bookmark the permalink.